I like to supplement my garden goodies with weeds foraged from the countryside. This year I decided not to forage for milkweed, since the Monarch butterflies are in danger. I do believe that you can harvest milkweed if it is in abundance in your area, but please check for Monarch eggs and caterpillars first! And remember to leave plenty for the butterflies. One of my favorite weeds is wild spinach or lambs quarters. 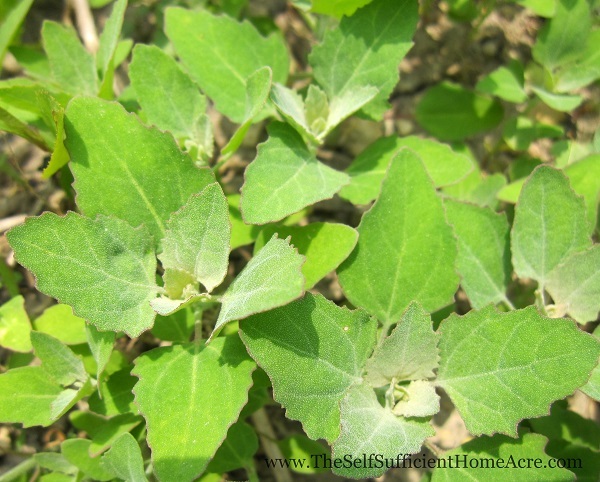 You can read more about them in my post Growing Lambs Quarters in My Garden. I also like to Freeze Lambs Quarters for the winter. These weeds have a very mild flavor, but have an unusual texture when eaten raw. Fresh salad with kale and day lilies from my garden. Daylilies are a mild flavored ‘weed’ commonly found growing along ditches. Foraging for Tiger Lilies is a great way to add some flavor to your salads. If you like strong flavored greens, you might like to try Sauteed Garlic Mustard Greens. Garlic mustard is an invasive plant and you should feel free to eat as many as you can find. One of my favorite wild foods are burdock stems cooked as Carduni. You can read more about Foraging for Burdock and Making Carduni if you’d like to try this traditional Italian dish. There are plenty of books available about identifying wild foods, but you might want to look a few up online first and see how you like them. 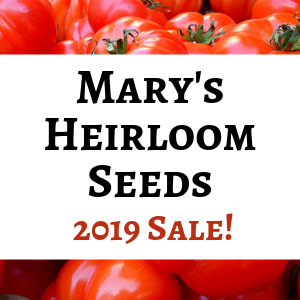 Check out this great post by Janet from Our One Acre Farm…12 Native Plants for Food and Medicine. Do you eat weeds? What is your favorite foraged food? I keep meaning to try nettles. They are supposed to taste like spinach – they have to be cooked of course. I have left too late again this year as they should be picked early in the spring. I haven’t had any nettles this year. They are pretty tasty, and sort of similar to spinach. I like them cooked into things. It might be a bit late for this year. Hi Lisa! Thanks so much for pointing to my post on 12 Native Plants for Food and Medicine. I agree with you about milkweed – both about its safety in moderation, and the importance of leaving most of it for wildlife. I don’t take it from the wild. Instead, I let it grow in our perennial garden, where it is very aggressive. To keep it from choking out the other plants, I harvest some shoots in spring. Since they are so delicious, they go on the dinner table rather than in the compost. Great post. It’s always great to inspire forage and deepen their connection to Nature. Happy to share a link, Janet…and thanks for sharing your method for conserving this wild plant and supplying food for your table too! I planted quite a few common milkweed seeds last year in hopes that I will have enough to harvest this year. I didn’t have as many as I’d like, so I went without the foraged shoots. Thanks so much for stopping by! I think that is one skill all children should know, how to identify edible plants in the wild.. but I too leave the milkweed..it grows in my horses field and I won’t even let him mow them. Hi Lisa! Just a “WARNING NOTE”! “MILKWEED” Isn’t “EXACTLY” the “Best THING” to EAT ANYWAY! ISN’T “IT” POISONOUS? There has been a lot of controversy over the subject of eating milkweed and there are several books out there that list them as mildly toxic. However, I believe that they misidentified another plant as milkweed and got sick after eating it. There is an excellent book available that talks about this very subject in great depth that you might enjoy reading….The Forager’s Harvest by Samuel Thayer. After reading Mr. Thayer’s account of eating milkweed, I decided to try it myself and found it to be a very tasty wild vegetable. Thanks for stopping by and bringing up this subject! I’m reading from the UK and love your posts. Having just this spring started to grow my own edibles I find your blog very enjoyable.